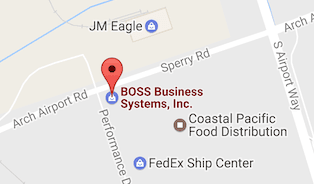 Printer Service Stockton | Boss Business Systems, Inc.
With the ever evolving push to make businesses “paperless” there has also been an ever increasing need to consolidate your office technology services with a single provider. Whether you are implementing a brand new Document Management System, a fleet of copiers and printers or even rolling out new computers for your network, having a one-stop-shop is paramount in this effort. How many business have heard the age old excuses from their providers: “It must be the phone companies fault” or “you should ask your IT guy”? With our host of hardware and software solutions you can bring everything under one roof with only one company to take full responsibility for your network and the device and software on it. With BOSS Managed IT Services through our partner All Covered no stone will be left unturned. With 24/7 network monitoring we will, in most cases, have your IT related issues fixed before you even know there was a problem. Backed by All Covered’s Network Operations Center in Arizona there will always be someone there to answer your call when you need help the most. Tired of reporting your meter reads manually? This will no longer be a problem when you are with BOSS. Through our use of PrintFleet we can see all of your printers on your network and also obtain reports when they need toner or service calls.